“Oprah’s Next Chapter” features a star-studded line-up with all-new episodes on OWN: Oprah Winfrey Network. Episodes include interviews with Academy Award®-nominated filmmaker Spike Lee (November 10), Reverend Al Sharpton (November 17), R&B powerhouse Kenny “Babyface” Edmonds (November 24) and basketball legend Magic Johnson (December 1). 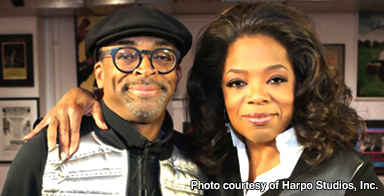 Oprah meets with Academy Award®-nominated filmmaker Spike Lee at the Brooklyn headquarters of his studio “40 Acres and A Mule Filmworks.” Oprah and Spike have a candid conversation about directing acclaimed actors including Denzel Washington and Samuel L. Jackson, how far he has come in his career since his film “Do The Right Thing” as well as his thoughts on fatherhood. He also talks about his upcoming film “Oldboy” and the controversial tweet he sent out following the Trayvon Martin verdict. NextCaving on immigration:Marco Rubio has unmasked himself as an opportunist whose most consistent commitment is to his own ambition.